After straining my brain, reading some comments and studying a few pages of the User Guide, my problem is solved! My difficulty loading my Gmail, Calendars and Contacts on my iPad was resolved effortlessly when I caved and called APPLE's iPad Tech Support. All I can is....THEY GOT AN "A"
So why didn't you tell me that a two step verification would cause the problem, Google? Seriously, it was one of THE most satisfying and pleasant experiences I've had! I don't have iPhones or iPads and the like but I have always had an Apple computer and I love my iMac. Glad you are back in business! refreshing to have a good customer service experience. I love their tech support, they are always polite and helpful. My warranty is over too, and they are going to walk me through an update. BUT I wish they would stop with all the ios updates!! I love hearing success stories! Glad you work it out! It's always frustrating! I have an android that thinks its 'smart' sometimes I am not so sure! LOL. BTW I loved your fence post! And thanks for coming by my 'Smiles'. I am so glad you had an easy time! I usually fumble around until something works.. Happy weekend! Creative shot! 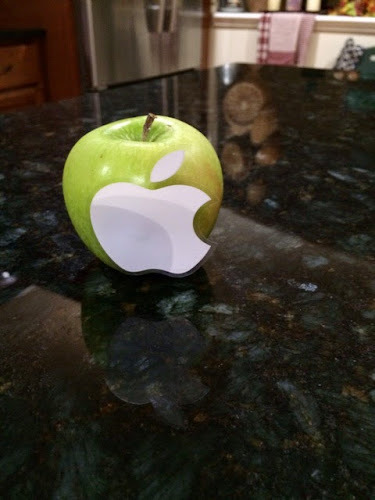 Love the Apple!